Thinking of adopting a Siamese cat? Below, we tell you all about Siamese Rescue, how and where to find cats that need new 'forever homes', and what you need to think about before you do anything else. My cat, Bandit, is a 'rescue cat' who came from the Siamese Cat Club Welfare Trust (SCCWT) in the UK. The SCCWT is made up of dedicated individuals, breeders and ex-breeders who are devoting their lives, time and money to taking in, caring for, and finding new homes for cats which for some reason have no other homes to go to. The SCCWT isn't alone. Around the world there are many rescue groups run by individuals or small groups of people who've made it their mission to take in and re-home these and other pedigree cats. In the general animal shelters there's often a time limit on animals' lives. Pets not re-homed within a specified period have to be put down to make way for others. Rescue us! Please rescue us ... please? Siamese rescue centers are generally in close contact with their nearest animal shelters and the local police, and will take over the care of any cats of this breed that are homeless or strays. Most of these specific breed rescue centers will not euthanize a healthy animal if there's any way of not doing so. Volunteers working for these rescues often find that they add an extra feline friend or two to their own households! So if you're specifically looking for Siamese cats to adopt, the first place to try is your nearest Siamese cat rescue organization. 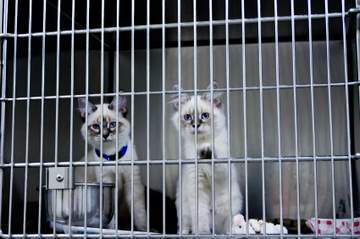 If you'd like to know the sort of questions you might be asked before contacting a rescue center, take a look at Siamese cat adoption considerations. Adopting a Siamese cat can bring enormous pleasure, as most people who've adopted one will tell you, but … it isn't always easy. Getting to know and live with cats when you may not know anything about their background can be tough, and many of them come with 'baggage'. Cats come into rescue centers for a number of reasons. Their original owners may have died, or the owner's financial situation could have altered, leaving them unable to afford to keep their pet. Their domestic circumstances may have changed – a new relationship or baby in the house can strain things between an owner and their pets and sometimes it's case of 'it's the cat or me'. The cats may have contracted illnesses that make it difficult to care for them, such as feline AIDs or the feline leukaemia virus. You can read Bandit's story on my Siamese cat adoption stories page. It may sometimes be possible to adopt a Siamese kitten from a rescue center, but it's rare. Why is this? Well, breeders of pedigree cats tend to like to keep in touch with people who buy their kittens. They'll generally take their own kittens back if they don't work out with the family who has bought them rather than risk their kittens falling into the wrong hands. And kittens are cute. Everyone loves kittens! So it's often when they're grown up into cats, and past the 'cute' stage, that their owners find they don't want them any more, and either turn them out or hand them over to rescue centers. So Siamese kittens for adoption may be difficult to find. How about rescuing an older cat? Many older cats are taken into Siamese rescue centers because their owners have died. These older cats may have some health problems and in some cases do need special kinds of care, but they also have a tremendous amount of love to give. They'll give this in return for regular meals, a comfy place to sleep, and your loving care. Not a lot to ask. Why not consider an older cat? I've put together a list of all the Siamese cat rescue centers I can find around the world. Why not give your nearest Siamese Rescue center a call to see whether they can help you adopt a lovable, loving cat or kitten who's looking for a good home?